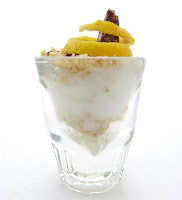 Today was Day #7 of Chocolate and Butter Theme Week, and Day #3 of Chocolate and Lemon Theme Week...and a Shotglass Dessert Day as well, where I squeeze tiny amounts of sweet things into a little glass. Portion control and good, creative fun, in equal measures. The first thing I noticed when I opened the packaging for today's milk chocolate, Coconut Caramel bar from Bissinger's (St. Louis, MO) was the back side of the bar, which was adorned with (sulfite-free) toasted coconut shreds. I broke off a piece, and saw pocket of soft caramel center, made with real butter and palm sugar. 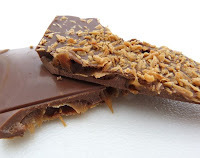 The Red Hawaiian Sea Salt combined with the coconut and caramel reminded me of a sweet coconut curry I'd had once, and it made me want to melt part of this bar down with a savory/spicy peanut sauce to use as an Asian dipping sauce or fondue. 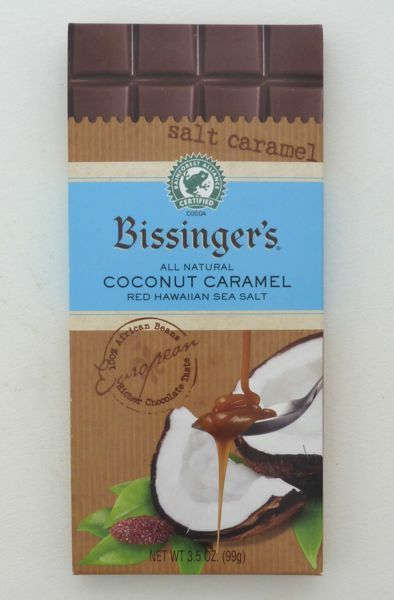 Bissinger's used cacao beans from Africa in this gluten-free bar. 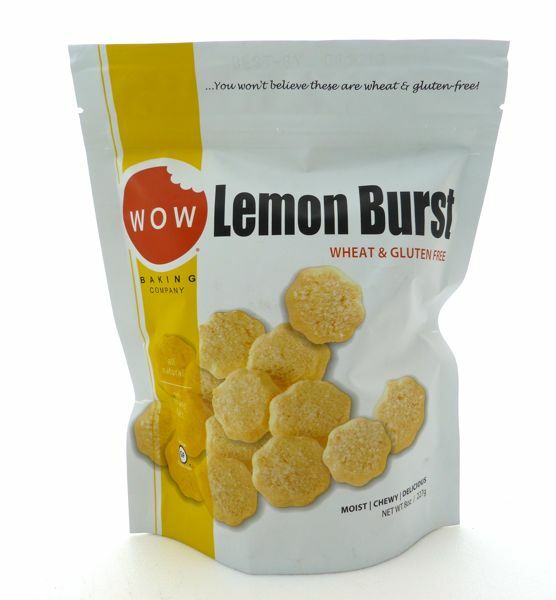 The company also teamed with the Rainforest Alliance to support sustainability programs that are "good for farm families, the community, the environment and wildlife." A company statement on the packaging read "Bissinger's uses 100% African cocoa beans, for a richer, more satisfying chocolate taste." It's harder to taste the pure flavors of cacao with milk chocolate and where there are additions to bars, but I'll look forward to sampling Bissinger's plain, dark chocolate in the future with this in mind. Shotglass Dessert - "Love on a Lemon Coconut Cloud"
The foundation, or bottom, layer for this shotglass dessert was a Lemon Burst cookie (chopped; with no wheat or gluten, but a bit of butter) from WOW (With-Out Wheat) Baking Company (Kent, WA). 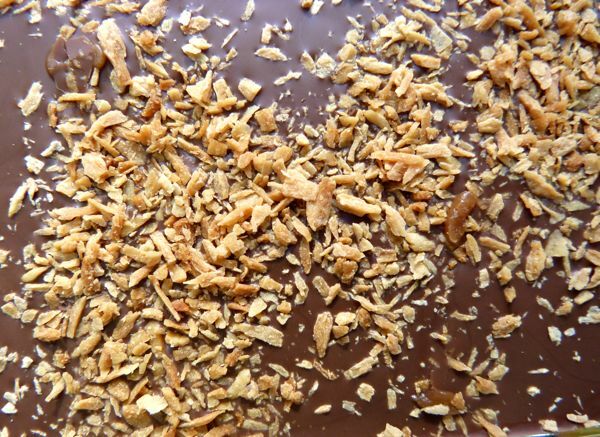 On top of the crumbs, I gently pressed in some coconut milk frozen dessert (you could also use ice cream). I sprinkled a few more Lemon Burst cookie crumbs on top of that; topped with bits/shards of Coconut Caramel bar from Bissinger's (St. Louis, MO); and garnished with a fresh Meyer lemon peel.